RSVP to [email protected] for address and details. The soul of a woman yearns to sit with her sisters, to be seen and cracked open, to reach vulnerability she’s been hiding away and feel deep connection sharing her fears and her dreams. All First People recognized undeniably the magic of the sacred feminine flowing. Her creative power connected to Mother Earth and the unseen world blooming. Women shape the generations of the future. The feminine is the creative power to generate new life, to heal, and create peace in union and communion, non-heirarchal order. I’ve spent years in reparation to the distressed and suppressed feminine in myself, healing my ability to love myself and learning to create secure bonds and relationships. Motherhood has been the vehicle for the majority of my growth. I have two daughters by whom I was profoundly inspired to re-parent myself while in the process of parenting their young souls. I feel a sacred opportunity to teach my daughters about sisterhood and to give them an opportunity to develop whole female relationships and a healthy relationship with the feminine. Healing our ancestors as well as the collective is vital to moving in the direction of the Rainbow Bridge and the 5th World of Peace. 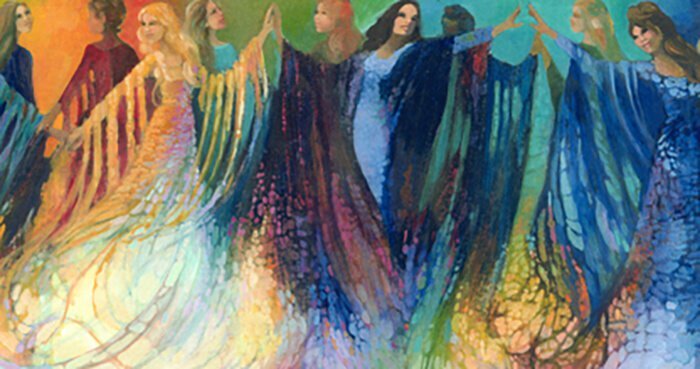 We all hold an element of the collective traumas of the feminine within our bodies. 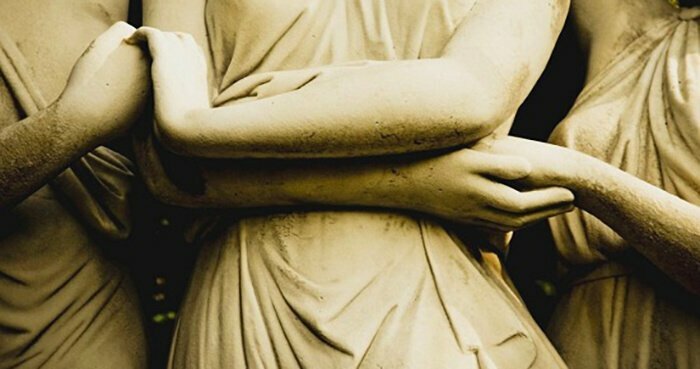 As we sit in circle with women over the years, sharing vulnerability and opening our hearts in trust, a kind resonation occurs healing the wounds of abandonment and traumas of scarcity based feminine beingness. The magnificence of sisterhood satiates the less than full and often empty bucket longing for authenticity, deep heart-centered connection. The safe container of sisterhood allows our expression of wildness that was so free in ancient times. 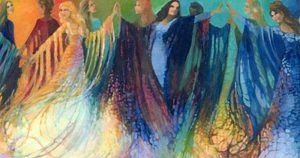 Honoring rituals create a place for women to replenish, percolate, dream, slow down and reconnect, during their moon time. A woman’s monthly moon cycle is infinitely more than just a physical cycle, it is a cycle of metamorphosis, tansmutation, wisdom, and rebirth each month. It is a time of reconnecting, possibility and potential. It is a time of cleansing and letting go. At this time a woman is more metaphysically connected to the unseen world. If she allows herself to retreat during this time, and be nurtured while her daily activities are cared for by her sisters she can easily open to her higher self, spirit guides and her dreamtime wisdom. Traditionally women were the keepers of the ancient mystical wisdom. Women’s bodies, the sacred vessels of creation and transformation, were honored through sharing rites of passage in a woman’s life, which were linked to her sexuality and fertility. Indigenous women cared for each other’s children as if they were their own. In today’s fractured society, some women feel alienated and lonely, hungry for this connection with other women that was such a natural part of everyday life. In the temples of ancient people, women were taught to develop their powers of perception, intuition, and how to sculpt the powerful energy of emotion. They studied how to awaken nurture and enhance their feminine gifts. Sisterhood is not an exclusive group. It is a way of being. It is a reunification of all that is magnificently and potently feminine. First, it is a choice to be alive and dazzling in your female mystery, and it is a path of heart-centered awareness. There is sisterhood between friends, between a mother and a daughter, a grandmother and her grandchild, a teacher and her student. Sisterhood is a movement of kindness. It encompasses all women, no matter what their shape, nationality or beliefs. It is an energy that encompasses men too and is healing for the planet. The archetypes of the priestess, the crone, and the goddess run deep in women, but are buried below the overwhelming responsibilities and daily demands women put on themselves along with the strenuous norms of society: to be the perfect mother, or model wife, amazing lover, and career woman. When women come together, this falls away and they create magic, an atmosphere that is potent and transformative, and a field that is electric. Sisterhood is a movement of Grace. There is no elite, no division, but a warm acceptance of all the colors, shapes and sizes of our sisters. Sisters are different flowers from the same garden. Each is unique and important to the garden. As we appreciate and support each other in our individuality, in beauty, body shape, dreams, life choices, or parenting choices, we create incredible freedom in ourselves and others. Sisterhood supports the expression of our full power as women. It is a supportive journey of mastery over our deep instinctual nature, our thoughts and our physicality. As we mold our inner world, we discover the power to manifest our dreams in the world around us. Sisterhood is a path of honoring our sensuality, and our beauty as women, of self acceptance of whatever that form of beauty takes, and of loving the unique divine expression of our bodies and faces. We have a responsibility to care for and love ourselves. Giving from our own overflow, we can honor our sisters and families in a deeper way. The true nurturing power of love is free to flow to everyone when it comes from a wellspring of potent and integral love for ourselves. In each womb, there lies the creative potential of the universe. Women have the capacity to bring their dreams to life out in the world. Here in service to the 5th World of Peace, we have a sacred responsibility to give to the Greater Whole and express this creativity, be it through creating a family, a connected community, harmony, works of art, dance, music or anything of beauty. When we create we keep our feminine energy balanced and the undeterred flow of creative expression nullifies the flow of scarcity, competition, jealousy and comparison with others. Now more than ever these sacred principles illuminated by the 13 Original Clan Mothers and Grandmothers are needed if women are to shine and impact the world around us, for our children, for our Brothers and Sisters, for All Our Relations of the past, present and future. For our world to heal, each woman needs to remember herself, find her inner light and emanate it out into the world. We need to guide each other home. Now is the time and the power is you. What is a Clan Mothers Circle? A year-long women’s group that meets one afternoon each month at a private residence in Agoura Hills, California. Generally women join the group and commit to attending regularly throughout the year; some women continue to participate year after year. Earnest women are welcome to join any time of the year. During our time together we create a sacred container, hold a talking circle, share sacred tea and food, discuss/listen to a Clan Mother medicine story, smudge, and laugh. In addition, wise-woman teachings about the medicine wheel and from and with each woman in the group. Every time Mother Earth completes her full rotation around Grandfather Sun, 13 Full Moons pass bringing a cycle of transformation for every human being and enourmous opportunity for growth and healing. The profound aspects of the female principle come forth with every full Grandmother Moon. Traditionally, for several days during a woman’s cycle, she would go to a sacred space where she could replenish, nourish and receive divine guidance. Women are the most connected to spirit during their bleeding days. These are the days for her to be taken care of and for her to retreat to her innerverse to connect to spirit through her womb.